11:10 PM, 1 July 2011. Having finished setting up my 'scope, the C8, for Kiron, I was ready to begin some observing proper in the Geoff Brown Observatory during the new Moon. I put the red film on Dell laptop which running TheSky6, of course, and driving the Paramount ME. I had left my netbook carrying case in the house so I was without it's red film frame for the LCD and both of my red LED USB keyboard lights. And somewhere along the way, I had misplaced my eyeglasses. 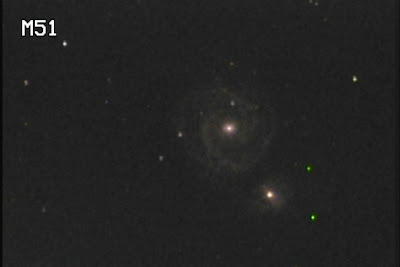 In short order I targeted the Whirlpool galaxy, Messier 51. I wanted, even though I still had the MallinCam up and running, to visually observe the supernova. I went to the house and turned on the laser printer. 11:31 PM. I remembered to bring the red film and keyboard lights to the GBO. Installed these accessories. On the Dell laptop, using Paint, I made an inverted black-on-white image of M51. Dropped the graphic into a Word doc and printed it. Fetched it from the house and handed it to Katrina. Returned to the GBO to stare at the galaxy 23 million light-years ago. 11:48. I spent some time with M51 to confirm positions of faint objects within it and foreground stars. And felt increasingly confident that I was able to see, visually, supernova SN 2011dh. Katrina, Sharmin, and Phil all took a look. And we all agreed Messier 51 was very faint. Phil didn't think the sky transparency was very good. Nothing, he said, compared their previous spectacular night. 12:18 AM. 2 July 2011. I viewed M51 through Katrina's 10" Dob. 12:20 AM. Continued comparing the view on the MallinCam to what I was seeing in the eyepiece of the C14. Couldn't understand, for the longest time, why I wasn't see the two bright stars near the companion galaxy NGC 5195. Everything else fit. M51 with a MallinCam Hyper Color. The two green stars are hot pixels. It wasn't until I moved the 'scope, and the "stars" didn't move, that I realised what was happening. Ha ha! 2 hot pixels! That's why! 12:28. I tried to focus the camera better. When Sharmin dropped in, I asked for her help. I don't know if I was able to improve on it at all. Didn't think to use my Bahtinov mask. We went to Messier 92 at Kiron's request. M92 compact globular was quite nice in the C14. Fired up my SkyTools3 planning software. Previously I had built a list of targets using the automatic Nightly Observing List Generator. The final collection added up to 261 objects. That was a little large... I spotted the fast-moving double star in Ursa Major. 12:49. I tried to view Alula Australis aka ξ (xi) UMa but the seeing was really crappy. And it was way too low. I could not split it. 12:54. I viewed M106. It was faint but large in the TV 27mm (at 145x). I kept staring at Messier 106. There seemed to be this stark edge in the spiral structure. It went from light to dark suddenly. It also seemed to be canted. Of the ST3 big list, I was feeling a little lost in or intimidated by or both. I switched to the Turn Left At Orion list for summer targets. 70 targets, by comparison. And I already had a good chuck of 'em done. Visited R Cygni aka HD 185456. I found a yellow star. There was a nearby bright star. Nothing terribly exotic. If I understand the designations correctly, the R means it is a variable star. But I didn't think to carefully compare the brightness to some of the nearby stars. And without any more detailed notes in ST3, I was left wondered what the point was. I noted that the wind and occasional gusts was causing the big telescope to shake. I removed dew shield. I was concerned that the integrated MCHC images were especially blurry. Despite the wind, the bugs were bad! The mozzies seemed to be persisting well into the evening. Some bit me through my bug suit. 1:41. I had removed the Sky Quality Meter earlier from the eyepiece cabinet so to remind me to capture some data. I took an SQM reading from the centre of the observing floor. I noted numbers around 20.14. I wondered if the red lights in the observatory, while set low, would affect the reading. In fact, I got a better result, 20.93, with the lights off. It was just Kiron and me left standing. We packed up. I debated leaving the C8 on the Observing Pad but I wasn't confident about the overnight weather. So, with Kiron spotting, I lugged the assembled 'scope into the GBO. Forgot to take some darks with the MallinCam... Need to do that. Then I can make the stills from the MallinCam better.